I ombré dyed our duvet cover ages ago, and then I had about ten ladies over for an ombré dyeing party, yet I’m somehow only just now managing to scrape together a tutorial! I’ll be sure to show you the duvet cover sometime soon, along with tips and tricks for dyeing such a large piece. In the meantime, you should try this. A couple of my ombré crafternoon party attendees dyed swimsuit coverups, and they turned out just as summery as can be. I definitely recommend a nice, bright lemon yellow for summer, and it fades light to dark really well! 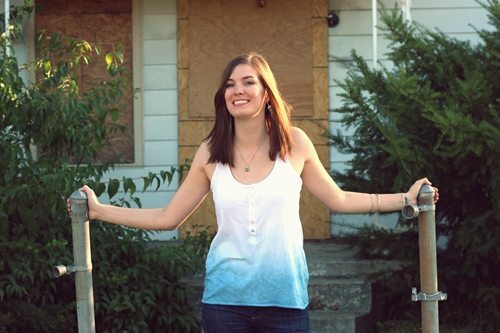 This project is another great way to get a new look and some extra mileage out of clothing and accessories you already own! If you have questions after you read through everything, leave ’em in the comments, and I’ll reply as soon as I can. There’s a little bit of a learning curve to get a really nice, gradual fade, but it’s fun to learn! 1. Flip your garment (shirt) inside out. Decide how far up you want the color to go. This will be the lightest part of the ombré. Mark a small dot there on the seam with your marker. Now, mark dots all the way down at even intervals, all the way to the bottom of the shirt. I marked a dot every two centimeters. Each dot will later guide how much of the shirt will get the next amount of dye. Since you’re marking on the inside seam, nobody will ever see the dots. 2. Wash your garment ahead of time to get any residue off it. 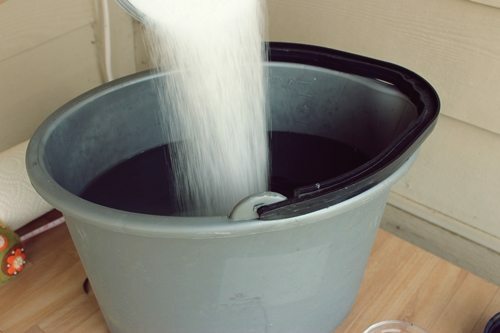 Mix water hot from the tap with the salt and soda ash. 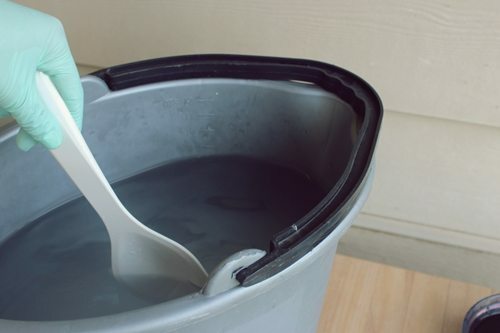 You’ll add one cup of salt and one tablespoon of soda ash per gallon of water. 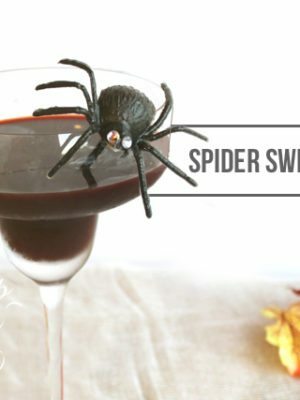 Stir it until it’s mixed thoroughly. 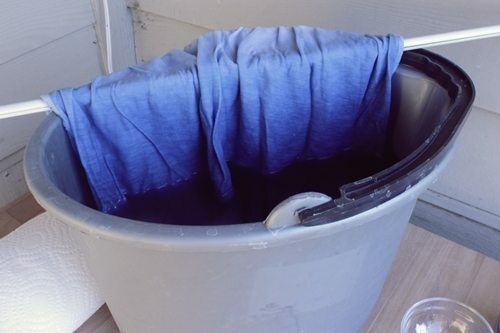 Dunk the shirt, and then wring it out thoroughly. 4. 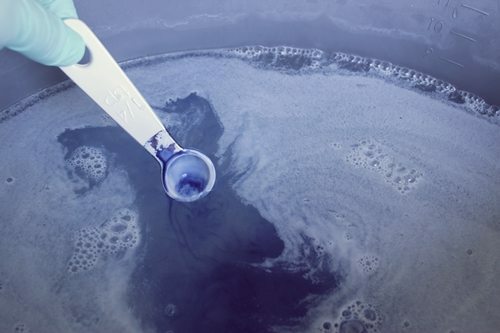 Add dye to the water 1/4 teaspoonfull at a time, until you have a light color. You can test it by dipping a white rag or paper towel. You want the color to barely show up. Stir it really well. Now put a rod of some sort – even just a clothes hanger – over the top of the bucket to hang the shirt. 5. Drape the shirt over the rod, and drop the bottom into the water until the top dot is level with the top of the water. Let it soak for three to five minutes. 6. Make sure you have no dye on your gloves. Pull the shirt up, letting the excess hang over the side, until the second dot is level with the top of the water. 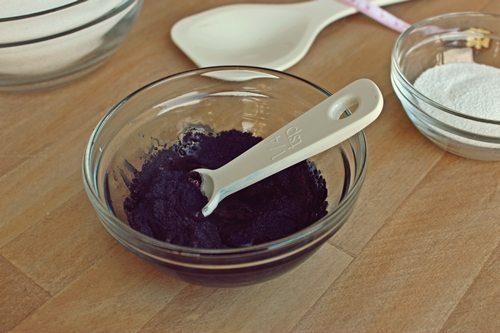 Now, very carefully, add another 1/4 teaspoon of dye. 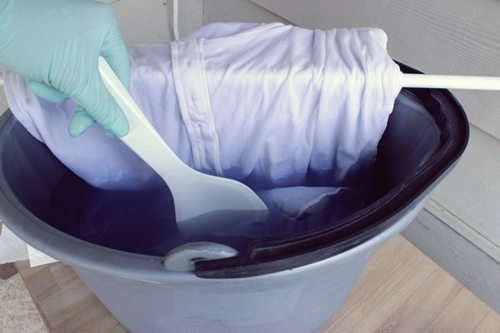 Dip it into the side of the bucket away from the shirt, and swirl the teaspoon in the water until the dye has all soaked into the water. Now stir it around with your big spoon, and let that layer soak another three to five minutes. 7. 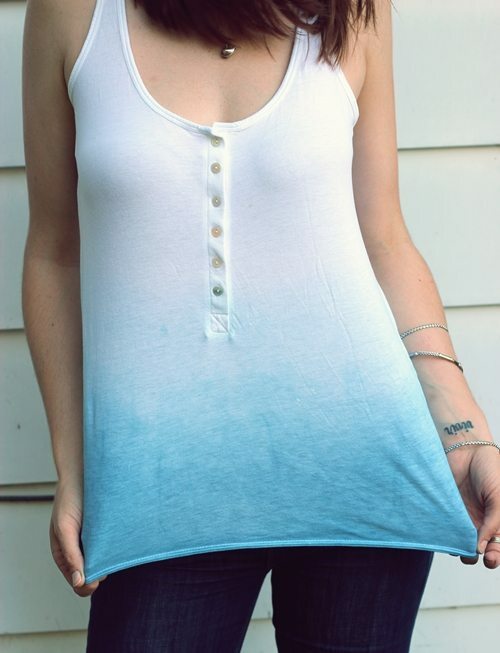 Continue pulling the shirt up, one dot at a time, while you add one more spoonful of dye at each new layer. 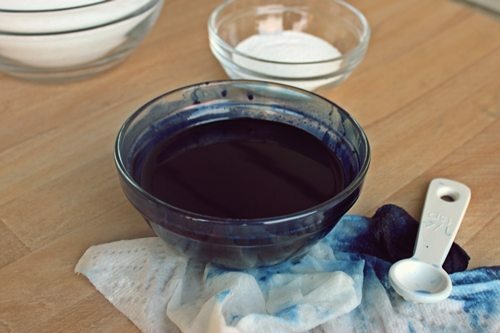 To deepen the effect, you can let the layers soak a bit longer each time so that the darker layers absorb more dye. When you get to the bottom, grab the shirt by the top, and wring it out from the top down into the bucket. Now throw it in the washer by itself, and wash it on the cold cycle. 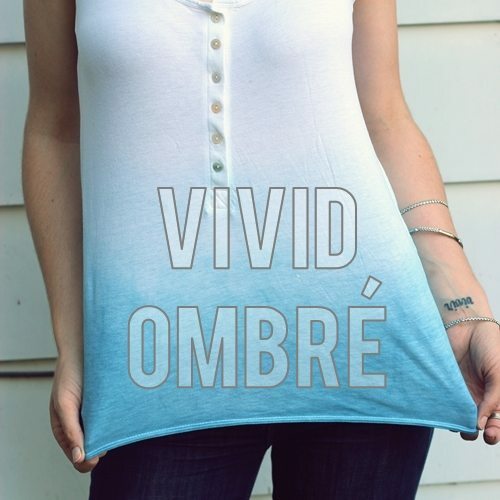 Voila – you should have a new piece of clothing with a gorgeous gradient! Oh, and don’t worry about it if you have some dye leftover. 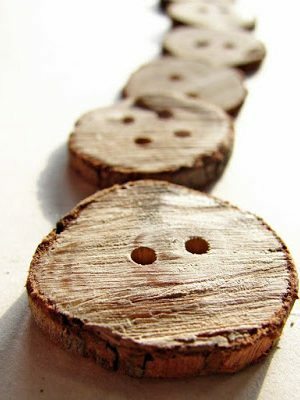 You probably won’t use it all, but you can go ahead and make something for a friend with the extra! Note – for a more subtle look, add less dye to each new level. This will also be the most flawless transition from dark to light. For a more intense look, add more dye. The more dye you add each time, the more difference you’ll notice between layers – kind of like stripes. 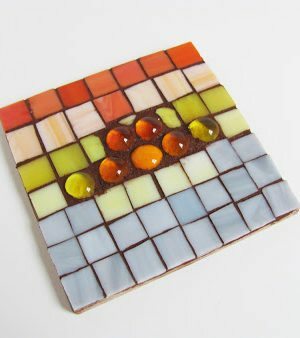 i love love this :) i’ve always wanted to try this but it always looked more complicated than it is. I LOVE THE FINAL RESULT, I AM SOING THIS AT HOME! THANKS FOR SHARING! Thanks, Kira, and everybody! 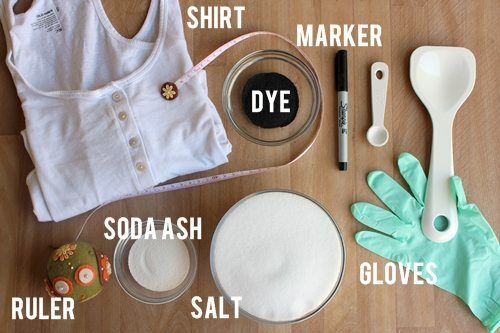 The soda ash “fixes” the dye to give it staying power and really work it into the fibers. Super cute, Lindsay! I’ve always wondered, what is the purpose of the soda ash? Sometimes I’ve used it while dying, sometimes skipped it. 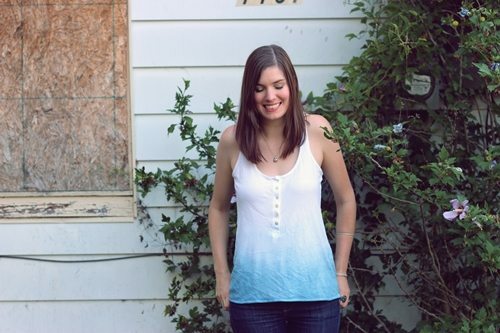 Love the tie-dye! Excited to try this! Anon, it says ‘vivir,’ which is ‘to live’ in Spanish. I got it before a Central and South American backpacking trip after college as a little reminder to always live life to the fullest! Out of curiosity, what does your tattoo say? I love word tattoos! Such a simple yet pretty way to get across meaning. Pa. The ombré looks lovely! The blue is so vibrant. I love this shirt! Great Idea! 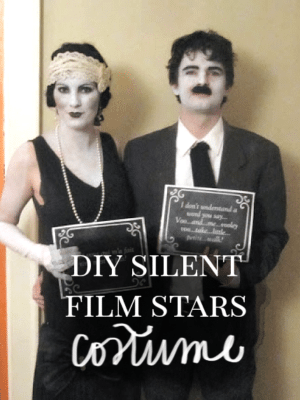 I have the perfect white dress to do this with. :) Thanks for the detailed instructions– can’t wait to try it out! Love the look! Did your hands turn blue? I bet everyone thought you were cold. 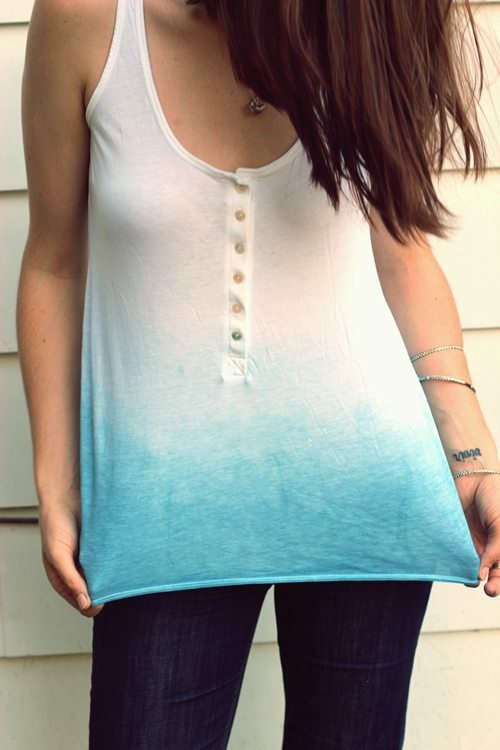 :) Love the ombre, and the swimsuit coverup would be a good idea.